AbigailNatenshon.com - Do You Have an ED? Eating disorders, contrary to popular belief, are not principally about food, eating, or weight management. The assumption is that anorexics under-eat and bulimics overeat and purge, but the issues are much more integrative and complex. Anorexia nervosa and bulimia nervosa, different manifestations of the same disease syndrome, are characterized by a preoccupation with weight and body shape, a pathological fear of becoming fat, erratic or inadequate food intake, and the inability to regulate eating. Eating is a metaphor for how we live; the person who cannot regulate food invariably has difficulty regulating other spheres of life as well. The person who fears weight gain is certain to be fearful of other elements of life pivotal to problem definition, problem-solving and the creation of a sense of autonomy and well-being. Driven by emotions, needs, and values, the eating disordered individual feels powerless, inadequate and fearful turns to behaviors and symptoms which create the illusion of being in control, establishing a pseudo-sense of security and predictability in an unstable world. Ultimately, the disorder takes control and makes a victim of its host. The eating disordered individual does not know how to “feed” or care for himself or herself, in more ways than one. With recovery comes an expanded emotional capacity to cope with all aspects of life, beyond food and eating. Anorexia Nervosa is a pathological fear of being fat, accompanied by food restriction and at times, purging and over-exercising. It is generally accompanied by a distorted body image, the absence of the menses, and moodiness, anxiety, or irritability. Bulimia Nervosa is the repeated cycle of out of control bingeing accompanied by purging or by fasting or excessive exercise to compensate for the intake of calories. Bulimics typically abuse laxatives, diuretics or diet pills and typically struggle with co-occurring addictions and mood disorders. Binge-Eating Disorder of Compulsive Overeating is characterized by eating when not hungry or without regard to physiological cues. With binge eating episodes, patient report the inability to stop or to control the behavior. Deprivation-sensitive binge eating arises out of the hunger of excessive dieting or food restriction; addictive or dissociative binge eating is the practice of self-medicating or self-soothing, with behaviors evoking tranquility or numbness. EDNOS eating disorders not otherwise specified, are eating disorders that fail to meet established clinical diagnostic criteria for frequency, duration, or juxtaposition vis-à-vis other symptoms as defined by the DSMIV. EDNOS make up more than half of ED cases and is rarely diagnosed, making the 11 million known victims of ED in the U.S. today but the tip of an iceberg. The following distinct aspects of eating dysfunction must be in place for behaviors to qualify as clinical eating disorders. The physical aspect may include weight loss, amenorrhea, fainting, cold intolerance, etc. The behavioral aspect may include dieting, secretive eating, binge eating, eating disregulation or rituals, compulsive exercise, laxative, diet pill or diuretic abuse, impaired relationships, etc. The emotional aspect may include depression, anxiety, low self-esteem, fear of weight gain, body image distortion, etc. The social aspect may include withdrawal and social isolation. There will invariably be a genetic predisposition for your child to have developed this disorder. Generally, those with predispositions to the onset of eating disorders will have eating disorders, addictions, alcohol or substance abuse, perfectionism or obsessive compulsive disorders in their extended families. Eating disordered individuals typically are of normal weight, and often appear to be the picture of health. Paragons of self-discipline, they typically excel at academics, sports, and other activities. Eating disorders are diseases, which in the vast majority of cases are totally curable. Dieting or food restriction is the worst way to lose weight and can be harmful to the metabolism. 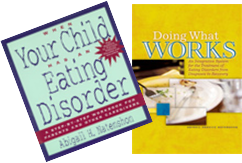 Parents are not responsible for causing eating disorders in their children. Parents and patients do not need to wait until symptoms of eating disorders have become full-blown and prominent before feeling free to take action. An educated hunch should serve as motivation enough to seek assistance. Eating disorder treatment and recovery are unique in many ways. 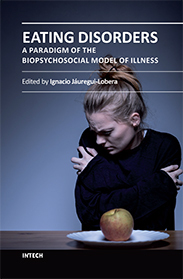 As examples, addressing these integrative disorders requires simultaneously addressing the wide variety of issues that the eating disorder encompasses. These include physiological, psychological, behavioral and nutritional issues. In eating disorder recovery, the patient can expect to feel worse before (s)he can feel better. The stakes are high with eating disorders, as these are the most lethal of all the mental health disorders. Not every eating quirk represents an eating disorder. The distinction between disease and benign idiosyncrasy lies in the purpose and compulsivity behind the behaviors for the individual. When the use of food goes beyond efforts to achieve satiety, fueling, or sociability, the writing may be on the wall. Eating disturbances in the very young child may be the result of anxiety and compulsivity, and/or the child’s imitating significant adult role models. In comparison, issues of control, identity, self-esteem, coping and problem solving largely drive adolescent and adult eating disorders.